For Aggressive Flat Sanding Constructed from firm density foam with a 35-degree blunt tapered edge for added durability, our 3M™ Hookit™ Clean Sanding Low Profile Disc Pads are ideal for aggressive flat sanding operations.Science of Dust Management Our proprietary multi-hole pattern works with a vacuum to help eliminate dust from the disc, workpiece, and air. We developed the Hookit™ system to makes disc changes quick and easy, enabling repeated use for the life of the disc, reducing material consumption and increasing parts per disc. 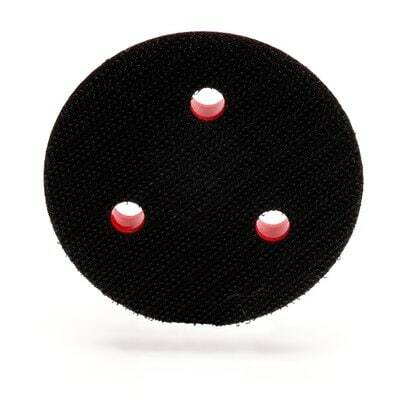 In addition, our 3M™ Clean Sanding Disc Pad is designed so hole alignment is not required, making our system even simpler to use than a standard “dust free” systems.3M Clean Sanding dust-management system features our proprietary multi-hole pattern and evacuates dust from the work surface better than 5- or 6-hole products. Reducing dust dramatically increases the cutting efficiency and life of the disc, which ultimately reduces operating costs.Optimized with a self-generated-vacuum sanding tool fitted with a Clean Sanding filter bag (sold separately), our Clean Sanding products allow the vacuum to suction dust from the air and off of the workpiece. This reduces loading of the disc and adds life to the abrasive. Additionally, reducing dust in the air improves working conditions. 3M Clean Sanding abrasives can be paired with Clean Sanding disc pads for use on a central-vacuum-ready sander.Focus on the Task at Hand with Hookit™ Attachment Whether your job requires a random orbital or rotary sander, buffer, grinder, drill, finishing sander or other power tool, 3M™ Hookit™ products allow you to focus more on the task and less on tooling. Hookit™ abrasive products with our hook-and-loop backing are manufactured with loop material that mates to a backup pad, each sold separately, where tiny hooks firmly engage the loops. Attachment is quick, easy, and secure during use. Sanding, finishing, and surface conditioning products with the 3M™ Hookit™ attachment and removal system gives you an efficient way to work through multi-step finishing processes and can be used again and again for the life of the abrasive.